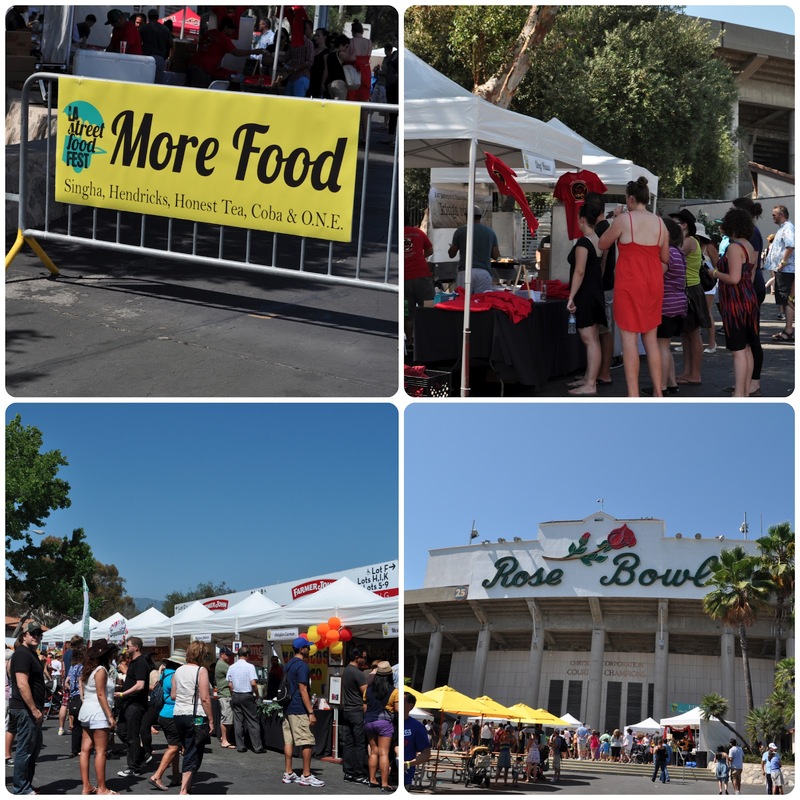 This weekend I had the absolute pleasure of attending the 3rd Annual LA Street Food Fest held at the Rose Bowl! It was my first year going and let me say, it definitely won't be my last! 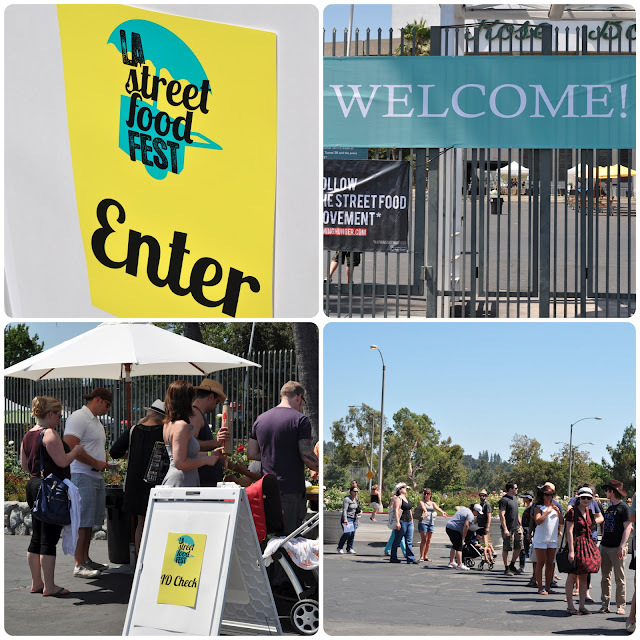 As you can tell from the title of this post, both Lili and I will be reviewing our time at the LA Street Food Fest. I'll be focusing more on the event itself and the meat dishes while Lili will discuss the vegetarian dishes and some desserts! Let's begin! I arrived at the Rose Bowl at about 2:45. Media check-in was a little before 3 and I wanted to make sure I had everything in order before your other favorite CF (Chronicles of a Foodie) blogger Lili joined me! 3PM was when VIPs were let into the event, and I have to say, I feel like the first two hours of just VIPs felt more crowded then at 5PM when the General Admit ticket holders were let in. Lili and our friend Cathy met me at 3 and then we were officially off on our food adventure! 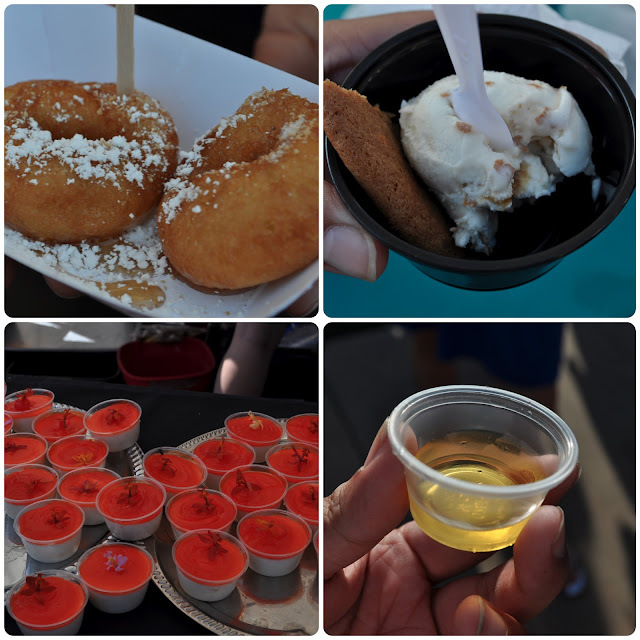 Once we got into the festival it literally was like stepping into a Foodie's version of Disneyland. Tents everywhere with all kinds of food with foodies drooling in line just to get a sampling of whatever they were offering! There was a kind of order to the way the booths were arranged. There was an Ice Cream Social area that housed about fifteen booths. K-Town had three Korean food based tastings. 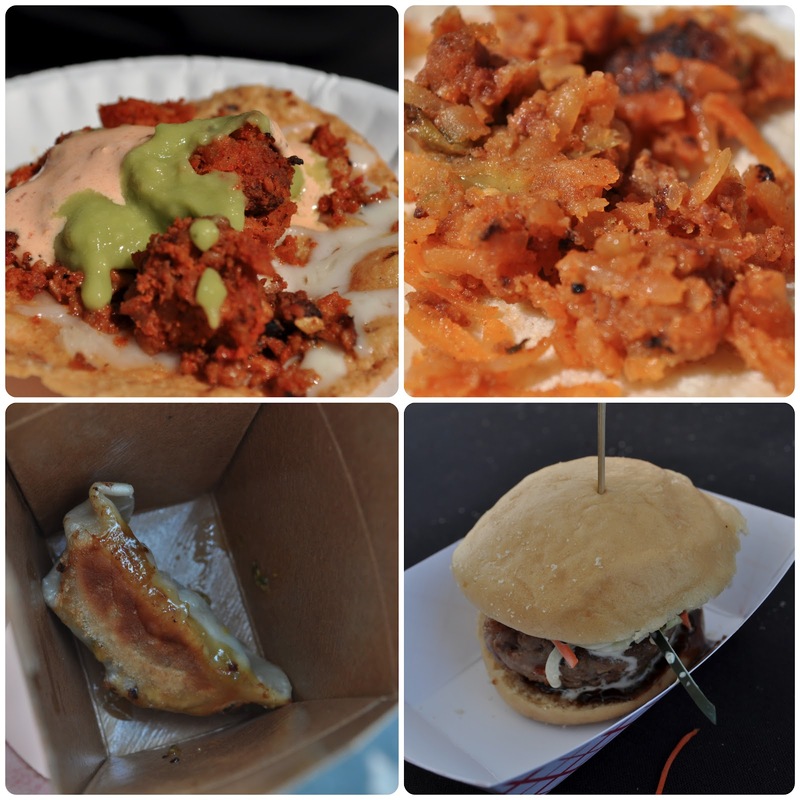 The Food Trucks (My Delight Cupcakery, Kogi, etc.) were stationed more toward the end of the booths and in between included everything from Teas and Pastries to Sea Snail Tostadas and Cow Brains! The lines look longer in the picture than they actually were, I think the longest we ever waited for anything was less than 5 minutes. These are the first dishes I sampled. The Park's Finest had a Coconut Beef over Rice dish served with a Cornbread Bibingka. I just need to say this now. It. was. TO DIE FOR. I'm half Filipino so I eat the homemade stuff, but you guys. No words. This was my favorite dish of the festival and one of the best things I've eaten in a LONG time. The beef incredibly tender and was covered in a coconut cream sauce so you get that creamy, cooling feeling and all of a sudden, some heat sneaks up on you. The whole thing is definitely a beautiful balance between the heat of the spices and the cool coconut cream. My dad would have fallen in love with the Cornbread Bibingka. He's a major bibingka connoisseur but even I thought this was sweet, flaky and delicious! The other dishes above include Roasted Pork Belly with Purple Rice, Paella and some baked goods and Berry Tea! Here we have my second round. A Cachetada topped with chorizo, melted queso, guacamole and some sort of sauce with a kick! A Chorizo taco. A Ginger Pork Dumpling (we actually wanted the Cheeseburger Dumpling but the Chef was pretty slammed trying to keep up with the demand and accidentally gave us two of the same dumpling). We were pretty bummed we didn't get to try the Cheeseburger Dumpling actually. Last but not least we have The Peking Duck Truck's debut dish at their first event, The Peking Duck Slider. As a blogger, I don't enjoy writing negative reviews but it's part of the job. I feel especially bad since this was The Peking Duck Truck's big truck debut but I have to be honest. I was excited to try this slider, duck isn't for everyone as it's a pretty gamey protein, but I grew up eating it so I'm definitely used it it. My first bite of this slider was like literally biting into a duck. It was incredibly duck-y and more gamey than any duck I've ever had. It really only got worse from here. I can't really give an accurate account of what the flavors of the slaw and other toppings brought to this dish because I didn't taste anything besides salt. I don't know if it was the Hoisin sauce or the way the duck was seasoned but in the words of Miss Anne Burell herself, "Holy Salt Lick Batman!" I even asked my friend to try it to make sure it wasn't just me any my palate. She had the exact same reaction. I really hope that The Peking Duck Truck can tweak their recipe because I'd love to try the truck again but not until this drowning their ducks in salt thing is fixed. Ah. Desserts. Lili will be going more in depth on the desserts but I just wanted to touch on my faves. French Toast Donuts from Astro's Mini Donuts...definitely famous for a reason. These things melted in my mouth and they were frying them up fresh at their booth! CoolHaus' ever infamous Fried Chicken and Waffles Ice Cream served with a Hotcake Cookie. This is literally the dessert version of making a visit to Roscoe's. Starry Kitchen's Salted Plum Lychee Panna Cotta. Again, one of the best things I had at the festival, seriously ridiculous. Mango tequila, one of several tequilas I tasted...I'm not a huge tequila fan but I definitely felt the burn from these spirits. Yes, I know, "Seriously?! MORE FOOD?!" Yeah, more food! It was an all you can eat and drink festival with a ton of vendors! I had to sample as much as I could! 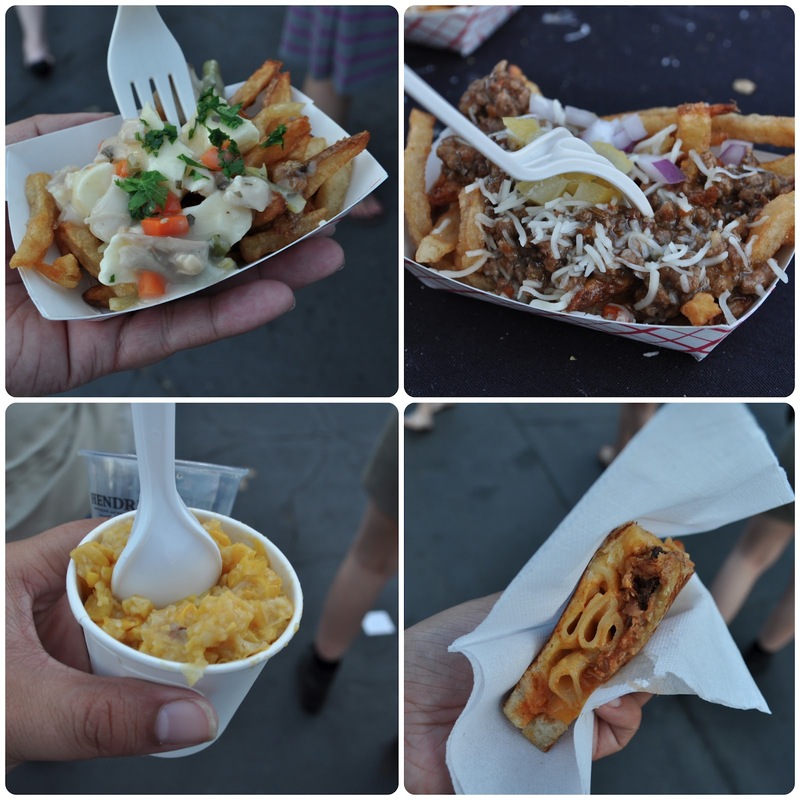 Frysmith made an appearance with some new dishes: Jidori Chicken Pot Pie Fries and Moroccan Lamb Fries! I tasted the Pot Pie ones, sounds weird but they were pretty good! I'd never had cheese curds before but they meshed well with the crispy fries, creamy gravy and shredded chicken! Border Grill had a Green Corn Tamal Corn, it was a small sample but it was really rich. I couldn't finish the cup but it was really good. I liked all the textures, the bite of the corn kernels and the grityness of the masa, and the sweet nature of the whole thing. The Grilled Cheese Truck brought their popular Cheesy Mac & Rib Grilled Cheese. I've had it before and it's pretty delicious. Overall, I'd call this event a huge success! The lines went by quickly, very few booths ran out of food and all the ticket holders were in high spirits (especially after indulging in some spirits!) 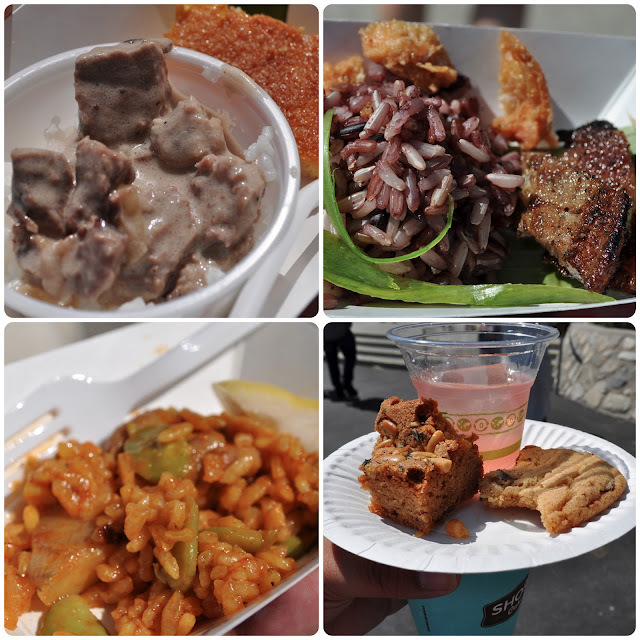 I can't wait to cover the event again next year but just like Christmas, the LA Street Food Fest only comes once a year! Visiting from SITS...looks like such a fun time! I love events like these where you can really see some creative and talented people create magic out of food. I was looking for something gluten and dairy free--the paella, perhaps? Gluten-free is becoming a bigger market (look out French-toast donut people--I can make an awesome GF donut!). Thanks for sharing and inspiring us armchair foodies. Looks like a wonderful afternoon! The food looks amazing! Wow! Looks really interesting, swallowed a couple of times as I looked at the pictures. Happy SITS day Ashley, enjoy every moment! I enjoyed every single picture and review in this post! Sorry about the salty gamey duck...I've never had but the concept seems interesting enough. I would love to go to one of these events. Enjoy your SITS day! Oh...this is divine!!! I makes me want to fly to my hometown of San Francisco right now. Well, after seeing this photos I'd definitely opt for a little trip to Southern California (just for a little bit). Happy SITS Day! OMG. I love food festivals. And festivals with food. And food. Happy SITS day! That looks like an awesome food festival!! What a fantastic food festival! I love that you were able to try out such a wide array of foods. That looks like a lot of fun! Enjoy your SITS Day! I love festivals of pretty much all kinds, but especially food. This sounds like a great event. I live in the OC, so we may be at the same event sometime. Following you on Twitter! Happy SITS Day!